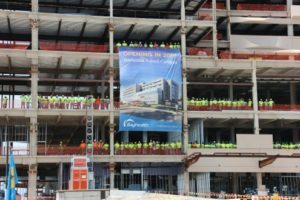 On Tuesday, July 11, Bayhealth celebrated a milestone in the construction of the new Bayhealth Hospital, Sussex Campus with the ceremonial “Topping Out” of the steel structure. Located in Milford, the 440,000 square foot hospital is slated to open in early 2019. More than half of Bayhealth’s contractors and subcontractors are Delaware-based businesses and more than half of the projects materials will be purchased through Delaware vendors. In fact, the approximately 6,750 pieces of steel used in this project were purchased from and fabricated by Crystal Steel, Inc. of Delmar, Delaware. The “Topping Out” Ceremony is a long-standing tradition in construction derived from an ancient Scandinavian builder’s rite held when the highest beam is fastened atop a structure. Community members, patients, physicians, employees and donors had an opportunity to leave their mark on history by signing the 13-foot long, 200-pound ceremonial beam at Downtown Milford’s Bug and Bud Festival. The beam was also available to sign on the Bayhealth Sussex Campus and in the lobby of Bayhealth Milford Memorial. Designed by architects from CannonDesign, the innovative campus will include a six-story hospital with an expanded emergency department, additional operating rooms, and all private patient rooms. As this is more than a hospital, there will also be a 70,000 square foot outpatient center allowing for additional services in one easy to get to facility. Nemours Children’s Health System will provide specialized services for children and seniors in a separate building on the Bayhealth Sussex Campus. In March, Bayhealth announced it reached an agreement with Nationwide Healthcare Services for the sale of the grounds that currently house Bayhealth Milford Memorial on Clarke Avenue. Nationwide plans to transform the 22-acre site and surrounding buildings into an innovative multi-use healthcare-focused community. 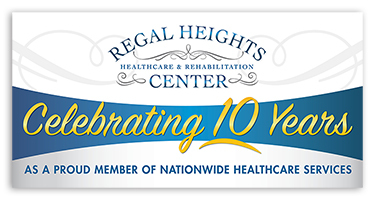 The agreement follows through on a commitment Bayhealth made in November of 2014 to find a buyer that could repurpose the property into a viable community resource once Bayhealth relocates to its new campus off of Delaware Route 1, near the corner of Cedar Creek (Route 30) and Wilkins Road.